Born in Medellin, Colombia, Erika Hernandez attended the University of New Mexico as an exchange student majoring in civil engineering. While at UNM, she got involved in undergraduate research in water resources and water treatment and became fascinated by the challenge of making water systems more reliable. So how did she end up at the University of Kentucky? In addition to UK having a strong history in the area of water resources research, Erika says fatherly prodding was a key factor. The majority of Erika’s graduate research occurs at a computer where she performs modeling and analysis. That is a good thing. Otherwise, in order to get at what she really wants to know, she would need to wield a sledgehammer and begin smashing pipes. “In my research, I am basically destroying the water distribution systems of hypothetical towns and trying to build them back up. That would be really expensive to do in real life and I don’t think anyone would like it if I came in and starting breaking things,” she laughs. Erika just finished her master’s degree in civil engineering and will begin her doctoral studies this fall. Her graduate research has helped establish the case that the location of a system’s isolation valves has a significant impact upon how much of a town will lose water service during a failure. “The idea is that if there is a failure, better access to the valves will affect fewer people,” Erika explains. However, few water companies have fully taken valve location into account during service failures. Worse, Erika says many towns don’t know where their valves are. Lindell Ormsbee, Raymond-Blythe Professor of Civil Engineering and director of the Kentucky Water Resources Research Institute (KWRRI), oversaw Erika’s master’s program and will continue to work with her as she begins her doctoral work. After she completes her Ph.D., Erika hopes to work in a research institute or with a consulting company. Eventually, however, she would like to teach at a university. 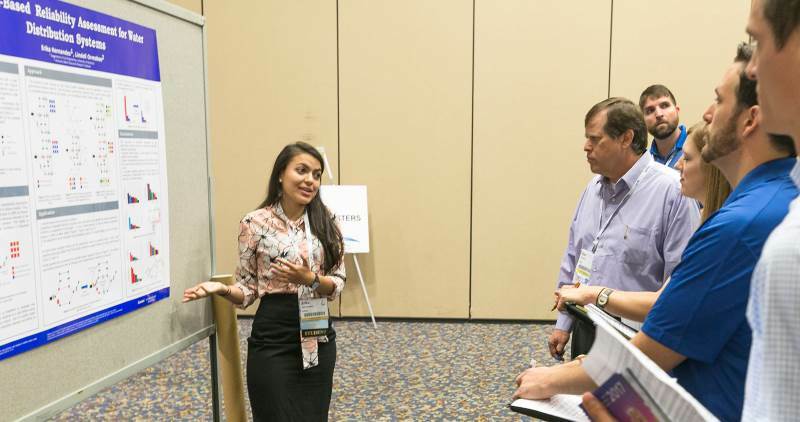 Her curiosity and dedication to advancing water distribution research will likely impact students who may then also take up their digital hammers and design better systems for communities of all sizes.